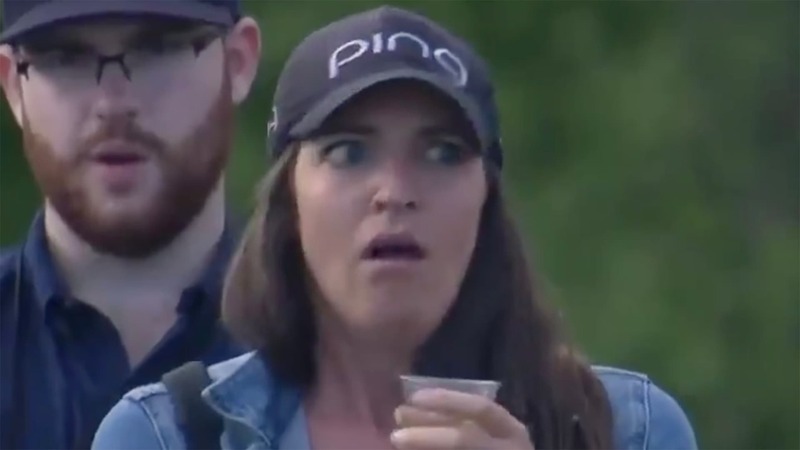 If you wanted entertainment, you’re getting plenty of it and then some at the 2019 Masters. And there’s still two more rounds to go. Try to pace yourselves. Day 2 at Augusta National had an incredibly tough act to follow after an epic opening round, but it easily topped it thanks to Tiger Woods, who made a second-round charge that bared a striking resemblance to some Tiger charges of old. It began at the par-4 11th, where Woods made the only birdie the hole yielded all day. He followed that with a well-struck tee shot at the par-3 12th that stuck about eight feet past the hole, and it was game on. But a weather delay robbed him of some momentum. After 30 minutes, he came back out and missed the birdie putt at 12, then made a par at the easy par-5 13th. When he snap-hooked his drive at 14, it seemed the energy had been completely sucked out of his round. But a heroic punch out and a slipping security guard flipped the momentum back in his favor, and Woods drained a long birdie putt at the 14th. He made one more long one at 15 and parred in for second-round 68, which puts him at six under through 36 holes. Woods is one behind five players who are tied for the lead at seven under, a group that includes Jason Day, who posted a five-under 67 a day after he re-aggravated a back injury while bending down to greet his daughter. He clearly felt better on Friday, as he made just one bogey and seven birdies to grab a share of the 36-hole lead for the second time in his Masters career. He last had a share in 2013, eventually finishing in solo third. Also at seven under are Louis Oosthuizen (66), Francesco Molinari (67), Adam Scott (68) and Brooks Koepka (71). The low round of the day (and the week) belonged to Xander Schauffele, who fired a seven-under 65 to vault into a tie for second at six under. Justin Harding (69) and Dustin Johnson (70) are also at six under. Neither Ian Poulter or Jon Rahm went low on Friday, but they each did some impressive grinding. At one point Poulter had made nine consecutive pars before holing back-to-back birdies at the 12th and 13th holes, eventually finishing with a one-under 71. Rahm, who began his round with two birdies on his first three holes, made 15 straight pars to close out a two-under 70. The duo is tied for 10th at five under. Phil Mickelson, Matt Kuchar, Charles Howell III and Patton Kizzire are tied for 12th at four under. Bryson DeChambeau, who began the day tied for the lead, posted a three-over 75 to fall to three under. He’s joined in a tie for16th by a group of six that includes Rickie Fowler and Justin Thomas. A bit further down the board you’ll find Jordan Spieth at one unde, while Rory McIlroy is at even par. Following matching rounds of 6-under 66 and two furious second-nine charges, Brooks Koepka and Bryson DeChambeau share the 18-hole lead at the 83rd Masters Tournament. Corey Conners had one of the more wild final rounds in recent memory Sunday at the Valero Texas Open. Four birdies in his first five holes, the Monday-qualifier then bogeyed his next four holes. Have no fear, though, as Conners would card six birdies on his back nine. His wife, Malory, could hardly believe what she was seeing from her husband. Conners’ back-nine charge vaulted him back into the lead down the stretch, and he earned his first win on the PGA Tour, a two-shot victory over Charley Hoffman. Now, with the win, Conners snags the final invite to the Masters Tournament at Augusta National. Not bad for a guy who was won a 6-for-1 playoff just to get into the Texas Open field.